← Richard Elmore on school reform. I was lucky enough to be able to go along to the above event that took place last week over 3 days at Stirling University. The theme of the conference was The visible and invisible in work and learning.’ What knowledge, which actors, and what parts of the environment are most visible? What and who remains invisible? When do actors become aware of invisible infrastructures? And what research methods and analytical approaches can make the invisible visible? Practitioners from many disciplines were involved and the wider perspective on learning, from educators, researchers, and academics from the fields of health, management, sociology, education, industry and science illustrated just how broad the spectrum of learning can be. It goes much further than schools; school based educators have lots to share in this regard but I think it’s fair to say that they also could learn something themselves from how the problem of learning is approached in other fields. Anyway, this really was my first real taste of international research events and it was a fantastic learning experience for me in many ways, and it also revealed a few surprises.I’ll attempt to share here some of my learning points and surprises from the three days. Learning point #1: Socio-materialism as a methodology really is a big deal in research in this domain. Is it a methodology or is it an analytical tool? This discussion arose out of an exchange around work involving early – career doctors when it was suggested that as most of the data were in the form of textual transcriptions they might be valued not as an object but as something else – discourse for example, and as such discourse analysis might be more appropriate. I haven’t looked into this in enough detail yet to be able to offer comment but it certainly seemed to be the preferred approach to research so I need to read more into it. Surprise #1: Researching academics are happy to share incomplete work. How refreshing this is! Coming from a culture in school-based education where there is a constant drip feed of “good practice” which has been identified and quality assured by policy-makers, and is presented more or less as a finished product with the expectation that if-they-can-do-it-so-can-you, this really was a revelation to me. There was a great deal of e focus on process whereas a lot of talk in school-based contexts is about outcomes – process and context are often sidelined. David Guile’s work on re-contextualisation has something to add here I’m sure. Learning point #2: presentation style in academia seems a bit old fashioned sometimes. I tweeted the suggestion of a power point ban after day 1. No-one except John Field paid any attention! Often there was far too much text on many slides, too many slides and not enough of the presenters were able to identify the headlines in their papers and talk about them succinctly in a very tight 20 minute slot. It’s difficult when the work is complex and in some cases spreads out over years but I think there needs to be a more realistic understanding of what is achievable in 20 minutes and present accordingly. However, on the upside, Professor Tom Devine gave a captivating talk for the day 2 keynote – zero slides! It is possible! Surprise #2: There was more variability in the presentations than I’d expected. Sometimes the actual substance of the learning being discussed was vague and unclear, as were the processes by which it happened and the outcomes of it. Sometimes the data were really interesting but the presentation style was poor. I guess it’s not really too surprising when there are over 100 papers being discussed. Learning point #3. English is unchallenged as the language of international research. This annoyed me – the non-native speakers of English were working twice as hard as the native speakers to express complex work in a second language. I found some of the concepts difficult to process in my first language, so I know I would have struggled in a second. This effort seemed to go unacknowledged – obviously it’s the way things are, and the way things need to be because native speakers of English don’t have the necessary language skills to be able to reciprocate this effort. There is another consideration to be made here though- what research are we missing because we ourselves don’t have the language skills necessary to be able to understand it? Only one German presenter made reference to this in his talk by mentioning some research he used which was in German, therefore inaccessible to non-German speakers, but for me this was a massive unspoken imbalance in the three day event. So now the work begins of looking at the papers and deciding which for me will be useful. I’m going to start with Anneli Eteläpelto, Katja Vähäsantanen, Päivi Hökkä, and Susanna Paloniemi’s paper on agency and search out some of the references I picked up from their poster presentation and take it from there. I’m also interested in “Searching meanings teachers attribute to curriculum reform”	by Krista Loogma, Meril Ümarik, and I want to follow up David Livigstone’s work as well – plenty to be getting on with for now. 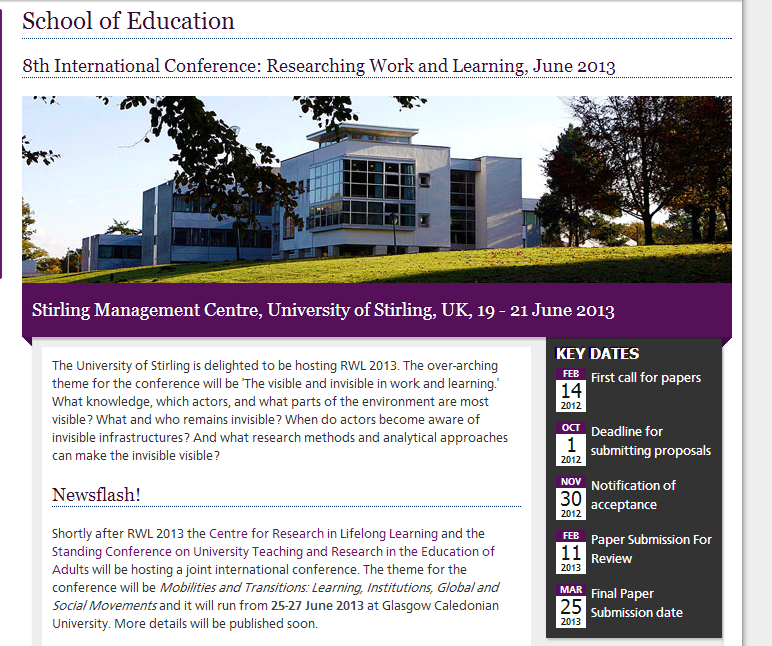 This entry was posted in Perspectives on Learning, PhD, Research and tagged RWL8. Bookmark the permalink. Glad you have a good conference!